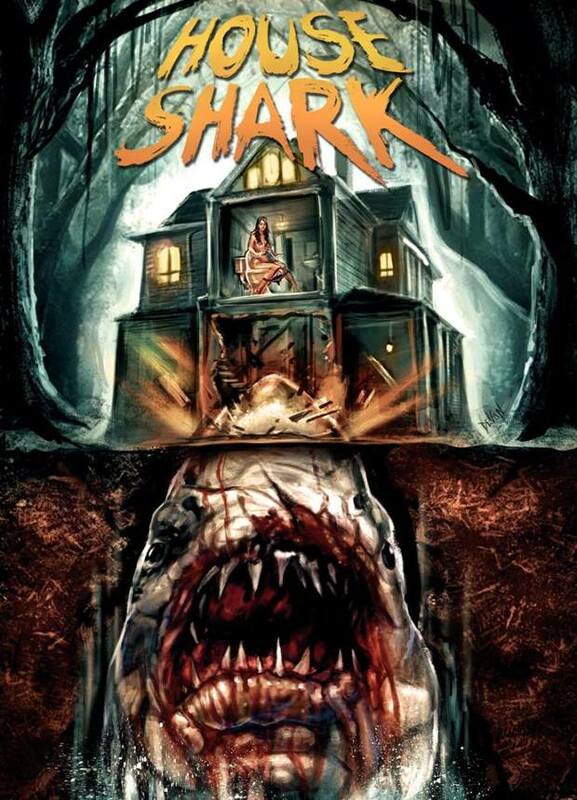 JAWS With a Mortgage: Indie Flick HOUSE SHARK Prepares to Attack! Indie filmmaker brings JAWS home-literally-with HOUSE SHARK! Veteran indie horror and exploitation slinger Ron Bonk,(THE VICIOUS SWEET, MS. CANNIBAL HOLOCAUST) contacted us today to alert us to his latest opus, a blend of THE STRANGERS and JAWS called HOUSE SHARK. We’ve seen SHARKNADOs, SNOW SHARKs. SHARKTOPUS’ and every other class of toothy “bad fish” so why not saddle a shark into a life as a dry-land domestic? Bonk and his gaggle of Bonk-ites have turned to IndieGoGo in order to round up the modest sum of 15K to bring this weirdo flick to life. I like Ron. He’s sincere. He loves what he does. And if the man wants to devote a portion of his lifespan to making JAWS in a house, then, Hell, all the power to him! Either way, it can’t be any worse than JAWS: THE REVENGE.